Estonia is a Baltic gem offering visitors the chance to see a tiny dynamic land on the shores of the Baltic Sea. Glorious beaches pepper the extensive coastline, although the swimming season is short. After all, the Baltics are not renowned for warm weather - something that any visitor to Estonia must be aware of — the summer is short and the winter is severe. Tallinn's medieval old town was built by German crusaders in the Late Middle Ages and is in magnificent condition, with the medieval city walls and towers almost completely intact and it rates as one of Europe's best preserved medieval old towns. Visitors can also experience an ex-Soviet occupied country that is now part of the European Union. Traces of the Soviet era are still there to be seen — e.g. Paldiski, a deserted Soviet army base that was once off-limits to Estonians themselves, can easily be visited on a day trip from the capital, Tallinn. After 7 centuries of German, Danish, Swedish, Polish and Russian rule, Estonia attained independence in 1918. Forcefully annexed into the USSR in 1940, it re-gained independence in 1991 through its Singing Revolution , a non-violent revolution that overthrew an initially violent occupation. highest point: Suur Munamägi 318m (in the south east of Estonia, 20km north of the main highway that runs from Riga to Russia close to the borders of Estonia with both countries). World War 2 and the subsequent occupation were devastating on humans, but the destruction and the closure of large areas for military use actually increased Estonia's forest coverage from about 25% before the war to more than 50% by 1991. Wolves, bears, lynx, elks, deer as well as some rare bird and plant species are abundant in Estonia. The wild animals from Estonia are exported to some EU countries for forest re-population programmes. Most animals can be hunted - according to yearly quotas.. Independence Day (iseseisvuspäev): 24 February; it is celebrated on the first date of independence in 1918, when Estonia declared independence from Soviet Russia. Estonia also declared independence from the Soviet Union on 20 August 1991, which is celebrated as a public holiday. There is always a military parade somewhere in the country on 24 February, although the weather can be too cold for some to come and watch. New Year's Day (uusaasta): 1 January; New Year's celebrations were promoted during the Soviet times, while Christmas was forbidden. After the restoration of independence, the significance of the New Year decreased, but it is still a celebrated as in the rest of the World. Good Friday (suur reede): moves from 17 March to 20 April (always on Friday). Easter Sunday (ülestõusmispüha): moves from 22 March to 26 April (first full moon Sunday after the spring equinox). May Day (kevadpüha): 1 May; first a Soviet-imposed Labour Day, when students and public employees were forced to take part in political processions, the importance of the May Day has moved to the preceding night on 30 April. Many Estonians then celebrate the Germanic Walpurgis Night (volbriöö) and dress up as witches and roam the streets. In the university town of Tartu, the mayor gives the power symbolically over to the students, who then gather to student organizations for the following night. Pentecost (nelipühad): moving from 10 May to 14 June. Victory Day (võidupüha): 23 June; celebration of the Estonian victory over the Baltic German Landeswehr in the Battle of Paju in 1919. There is usually a smaller military parade somewhere in the country on 23 June. Midsummer Day or (jaanipäev): 24 June; the summer solstice, which is however celebrated on the previous night on 23 June, on St. John's Eve (jaaniõhtu or jaaniöö). It is recommended to attend the semi-public celebrations in any Estonian village. Most villages and many residents themselves organize large bonfires for the evening. There is also a tradition to jump over the bonfire. In the West Estonian islands, there are sometimes old fishing boats burnt within the bonfires. The sun only sets for a few hours on that night and it never really goes completely dark and many Estonians have the tradition to stay awake at least until sunrise. Day of Restoration of Independence (taasiseseisvumispäev): 20 August; celebration of the restoration of independence from the Soviet Union in 1991. Christmas (jõulud): from 24 to 26 December; Christmas in Estonia is a mix of Estonian and Western traditions. Celebrating Lutheran Christmas in December instead of Orthodox Christmas in January was forbidden during the Soviet Occupation and Christmas were celebrated in secret. Today it has remained a strictly family holiday. All national and public holidays are a day off for workers in general, but most convenience stores remain open during regular hours. Estonia itself is divided into 15 counties (or maakonnad, singular - maakond). However, to bring out the unique characteristics of Estonia, we use 4 distinctive regions in this guide. As the country is small, most destinations can be reached within a couple of hours from Tallinn. It's the most industrialized region with over 1/3 of the population of Estonia. Tallinn, with its nightlife and UNESCO-protected medieval Old Town, is a well-known tourist attraction. Nonetheless, there are many small and beautiful beach villages on the coastline as well (such as Kaberneeme, Laulasmaa, Nõva, Käsmu and Võsu). Furthermore Lahemaa National Park can be reached within an hour from Tallinn. East Estonia is as close as you can get to Russia. Seaside resorts, such as Toila and Narva-Jõesuu, are considered to be among the best in Estonia. West Estonia is well known for its resorts, Haapsalu and Pärnu (the summer capital of Estonia), and its islands (Saaremaa and Hiiumaa being the biggest). This region also has historical significance. Noarootsi and the islands of Ruhnu and Vormsi have been (and are) inhabited by coastal Swedes. 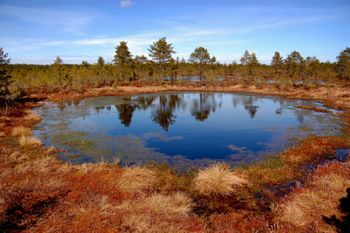 Other unique places include the islands Kihnu and Muhu with their rich cultural heritage and the national parks — Vilsandi National Park and Matsalu National Park. Centered around the lively university city of Tartu. Further south and south-east there are Setomaa and Mulgimaa with their unique cultural heritage that's still visible today. Karula National Park and Soomaa National Park are also part of the region, as are the ski resorts near Otepää. Estonians have a special love for nature, and many will tell you that they would rather sit under a tree in an empty forest or hike in a national park than almost anything else. Estonia's tranquil, laidback and unspoiled Baltic islands provide a splendid getaway to nature. Estonia is a member of the Schengen Agreement. A growing number of foreign visitors have been travelling to Estonia in recent years. According to Statistics Estonia  the nation's statistics agency, 1.3 million foreigners visited the country in 2000, and that number climbed 38 percent to 1.8 million foreigners by 2005. Tallinn is Estonia's main international gateway. In addition to direct daily flights to/from all major Scandinavian (Stockholm, Copenhagen, and Oslo) and Baltic cities (Riga and Vilnius), there are direct flights from all major European hubs like London, Paris, Frankfurt, Brussels and Amsterdam and regional hubs like Prague and Warsaw. Eastward connections are from Moscow, St. Petersburg and Kiev. Local carrier Nordic Aviation Group  provides half of the services and the rest is provided by Finnair, SAS, Lufthansa, LOT, CSA, Air Baltic, Ryanair and others. Easyjet is one of a few low-cost carriers that provide service between Tallinn and major European cities. Travelers can pay as little as EUR 120 (US$160) or £80 Sterling to fly roundtrip from London to Tallinn. From London's Stansted Airport, Easyjet provides nonstop service to Tallinn. From Frankfurt, choose from Lufthansa and Estonian Air. From Brussels, select from KLM, Estonian Air, Finnair, SAS, RyanAir, Lufthansa and Czech Airlines. From Amsterdam, choose from KLM, Lufthansa, SAS, Czech Airlines, Finnair, LOT Polish and Estonian Air. From Rome's Fiumicino Airport, select from Alitalia, Czech Airlines, Estonia Air, KLM and Finnair. From Helsinki Vantaa airport select from Estonian Air, Finnair, FlyBE. Daily domestic flights are from Tallinn to the islands of Hiiumaa (Kärdla) and Saaremaa (Kuressaare). Tartu is one of Estonia's oldest towns and a key to South-Eastern regions of Estonia, ancient Russian Pskov or further to Latvia. Flights map of the local airport includes Helsinki by FlyBE airline and Tallinn by Estonian Air, which makes a roundtrip Helsinki-Tallinn-Tartu very easy in any combination. Lennart Meri Tallinn Airport or Ülemiste Airport  (IATA: TLL) (ICAO: EETN), about 5 km from the city center, is increasingly becoming an airport hub of the Baltics. Estonian Air  provides good quality services to a series of European cities. Other major airlines include Finnair, SAS and EasyJet. Bus line 2 runs from the airport to downtown Tallinn and taxis are also available. Tartu Airport or Ülenurme Airport  (IATA: TAY, ICAO: EETU) is located 10km from Tartu centre. The airport's bus stop is located in front of the terminal. Bus travels on the route Ülenurme - Tartu City Centre. The bus fare is about €1 and tickets can be bought from the bus driver. There is also the airport shuttle service at 3EUR from/to any location in the city. Kuressaare Airport  (IATA: URE, ICAO: EEKE) is situated 3 km from the town of Kuressaare on Saaremaa island and offers regular flights to Stockholm and domestic flights. International train services are to/from Russia, Moscow. Domestic services  connect Tallinn with Narva in the east and Viljandi in the south, Pärnu in the south-west, Tartu and Valga in the south-east. Baltic Station railway terminal in Tallinn can be used to start your journey. The station can be accessed from town center and vice versa by tram number 2 - use the "Balti jaam" stop. The platform and trains are modern and the fares are reasonable. Free wifi is available on Elron trains. Good road connections are to the south (Via Baltica routing Tallinn-Riga-Kaunas-Warsaw) and east (Tallinn-Saint Petersburg). The domestic road network is dense and covers all regions of the country. Lots of good and cheap connections from Moscow, Saint Petersburg, Kiev, Kaliningrad, Warsaw, and all larger Baltic and German cities. The most popular regular service provider is Luxexpress Group , others include Ecolines  and Hansabuss . Ferry lines connect Tallinn with Sweden (Stockholm), Finland (Helsinki, Mariehamn) and also with Germany (Rostock) during the summer months. Tallinn-Helsinki is one of the busiest searoutes in Europe and has daily 20 ferry crossings and nearly 30 different fast-boat and hydrofoil crossings (the latter do not operate during winter). For details see Port of Tallinn passenger schedules . the train to Viljandi is coupled with the train to Pärnu, which will be unhooked at Lelle. So be sure to get on the right one. Ask the ticket seller if in doubt or check out the screens. some platforms in smaller settlements are short. So entry and exit will take place from the carriage marked with the letter 'C'. Which is where the toilet and bicycle holders are. taking a bicycle on the train is free, but depending on the route, the day and the time, all 10 spots could be taken. To avoid standing guard over it, one can use another carriage and using the lock, attach it to a railing near the doors, so it does not fall when the train is braking. But keep in mind if the place you get off has a short platform or not. Tpilet.ee - this shows probably all the departures between bigger towns, but it does not show all inter-county ones. One can buy a ticket there, the website accepts credit cards and payments through bank links of local banks. The FAQ section says which lines accept tickets shown off one's phone, by scanning it's QR code or otherwise. peatus.ee - fills in some blanks that Tpilet might not show, typically lines between smaller places. There are also various bus companies that service lines heading outside Estonia as well, such as Eurolines, Lux Express, and surely several others. As of 2018-07-01 Estonian government made some county lines free of charge, so don't be surprised if the bus driver does not want your money. Pro-tip: If you want to travel between Pärnu and Haapsalu, then the journey planner on either of those sites does not show all the options. One could either look for departures to and from Lihula, which is between those two and might have a decent connection. Or go through Tallinn, but the journey planner will not tell you, nor will the website of Lux Express, that one can get off and on at Vana-Pääsküla stop, which saves 20 minutes each way. And possibly from having to wait for another trip. An excellent day trip is to drive from Tallinn to Tartu. It takes about 2.5 hours each direction. As of September 3, 2006, the drive from Tallinn to Tartu has been much improved. Outside of Tallinn, it is a two lane paved road with some construction ongoing to upgrade it. It takes two to two and a half hours. There are few sights of interest along the way. The terrain is flat and most of the road is bracketed by a birch tree and a few pines. Sam's Grill (about 1/2 way between Tallinn and Tartu)is recommended as a place to stop. There is a gas station next door. The official language is Estonian which is linguistically very closely related to Finnish. Russian is by far the most spoken minority language in the country. Russian is the native language of just under half the population of Tallinn, with 66% of Estonians in total having at least some knowledge of the Russian language. English is also spoken by around 50% of the population, especially by the youth. Thanks to heavy tourism and popular TV broadcasts from the other side of the gulf, Finnish is also spoken quite well by many people in Tallinn. German is taught at school in Estonia, and around 10% of the population can speak it. The main reason most people first come to Estonia is to see the best protected and intact medieval city in Europe - Tallinn. The unique value of Tallinn's Old Town lies first and foremost in the well-preserved (intact) nature of its medieval milieu and structure, which has been lost in most of the capitals of northern Europe. Since 1997, the Old Town of Tallinn has been on UNESCO's World Heritage list. Living under the rule of Scandinavian kings, Russian empire and Teutonic Knights has left Estonia with unique and rich blend of historic landmarks. Over one thousand manors were built across Estonia from the 13th century onwards. Some of the manors have perished or fallen into ruins but a lot have been reconstructed and now are favourite attractions with tourists. Nowadays there are about 200 manor houses  under state protection as architectural monuments and 100 in active use. Estonia has over 1,500 islands. The nature is essentially untouched and offers quite a different beach experience with their remoter rustic feel. Most of the public beaches are sandy and the average water temperature is 18°C in summer. Inland waters and some shallow bays' waters are even warmer. The largest island is Saaremaa with an intact and well-restored medieval castle in its only city, Kuressaare. Stone fences, thatched roofs, working windmills and home made beer are all distinctive to Saaremaa. Hiiumaa, on the other hand, is well known for its lighthouses, unspoilt nature, the Hill of Crosses and the sense of humour of its inhabitants. Both islands have an airport so they can be quickly reached from Tallinn. Other important islands include Kihnu, Ruhnu (with its "singing sand" beach), Muhu and Vormsi, each with its own unique characteristics. Most of the other tiny Estonian islands don't carry much cultural significance, but can be appealing for bird watching, canoeing, sailing, fishing etc. In July and August, Pärnu, Estonia's summer capital, is the main attraction. The coastline itself has loads of untouched beaches and a tour from Narva-Jõesuu (in the East) towards Tallinn is great for exploring the coastline. Some of the well known places include Toila, Võsu, Käsmu and Kaberneeme. Tickets for events can be bought online via Piletilevi.ee  or the lately established Ticketpro.ee . There's quite a good list of various events in Estonia at Visitestonia.com . Self guided tours are a good way to discover Estonia by yourself. For more information please visit the self-guided tours and interactive maps sections on the official tourism website. Estonia has the euro (€) as its sole currency along with 24 other countries that use this common European money. These 24 countries are: Austria, Belgium, Cyprus, Estonia, Finland, France, Germany, Greece, Ireland, Italy, Latvia, Lithuania, Luxembourg, Malta, the Netherlands, Portugal, Slovakia, Slovenia and Spain (official euro members which are all European Union member states) as well as Andorra, Kosovo, Monaco, Montenegro, San Marino and the Vatican which use it without having a say in eurozone affairs and without being European Union members. Together, these countries have a population of more than 330 million. The Estonian kroon (EEK) ceased to be legal tender on January 15, 2011, but any kroons you have left over can be changed into euros at the Bank of Estonia  at a fixed rate of 15.6466 kroon to €1. ATMs and currency exchange offices (valuutavahetus) are widely available. You will get the best rates by exchanging only after arrival in Estonia. Avoid changing money in the airport or port as the rates are lower. As a small nation, Estonia's souvenir shops are often filled with characteristic items from neighbouring countries, for example with Russian matryoshka dolls or Baltic amber. While both of them are popular among tourists, it is worthwhile to understand that neither of them have any historical or cultural connection with Estonia. In July 2012 bottle of local beer (0,5l) costs around 1€ in shops and 2,5-3,5€ in modest pub. Many types of food are close to Russian and have their equivalents almost exclusively in the former USSR, such as sour cream hapukoor, smetana in Russian, a sour 20%-fat milk dressing for salads, especially "kartulisalat" or "potato salad", which isn't that rare anywhere else either, really. Like their neighbours the Finns and the Russians, the Estonians know their alcohol. The two largest breweries are Saku  and A. Le Coq , which both offer a variety of different beers. Recent years have seen a surge in local micro-breweries, the products of which are becoming more and more available in larger shops. Baltic Porters (Põhjala öö, Saku Porter) are strong and heavy dark beers with a touch of caramel to be had in winter. The best-known local vodka is Viru Valge (Vironian White)  and then there's the surprisingly smooth and tasty rum-like herbal liquor Vana Tallinn (Old Tallinn) , famous in the countries of former USSR. A local soft drink is "Kali" (the Estonian equivalent of "kvass"), made from fermented brown bread. It can be described as an acquired taste. Many locals also swear by "keefir", a fermented milk concoction. Number of hotels has exploded from few to tens and hundreds after Estonia restored independence. In 2004, Tallinn achieved first place among the Baltic Sea cities in the number of overnight stays in hotels, though still behind Stockholm and Helsinki in the number of total overnight stays. A list of bigger hotels as well as some restaurants and nightclubs could be found at Estonian Hotel and Restaurant Association . The official tourism site Visitestonia.com  also has information and listings about B&B accommodation, youth hostels, camping and caravan sites etc. Estonia has a fair amount of foreign students studying in its universities, especially from Nordic countries, as Estonian diplomas are recognized throughout the EU. See the articles for university town Tartu and capital Tallinn for details. No obstacles exist to citizens of EEA countries to come to invest and work in Estonia. Citizens of developed non-EU countries are exempt from short-term tourist visas. Swedes and Finns have by far the largest working community of post-Soviet foreigners in Estonia. Estonia may have had rocketlike growth in recent years, but only from a very low base as a former Soviet republic, and average local monthly salary (4th quarter 2007) is around 800 EUR. Education is highly valued in Estonia because as a small nation with no exceptional natural resources, they believe that the only way to be competitive is to absorb knowledge. There are so many highly educated people in Estonia that it is a problem in the labour market - there aren't enough workers for jobs that require minimal education. Considerable investments and some workers are constantly coming from CIS countries, though significant legal restrictions are imposed. Police and Border Guard Board  is the authority responsible for dealing with the paperwork. CV Online  is one of the oldest Estonian recruitement and HR services operating in 9 countries (as of 2005). The published crime rate increased dramatically in 1991-1994 after democratic freedoms were introduced. In a large part, this is due to the fact that crime was a taboo subject before 1991, as Soviet propaganda needed to show how safe and otherwise good it was. The murder rate per 100,000 inhabitants, as of 2000, was some 4-5 times higher than in Sweden and Finland, although still significantly lower than in its biggest neighbour, Russia. Many Estonians drive carelessly, with about 60 to 80 people killed and 1000 people injured per year. Number of deaths in traffic related accidents per 100 000 people are similar to South-European countries like Portugal or Italy. Estonia has strict drink-driving laws with a policy of zero tolerance, but accidents involving intoxicated drivers are nevertheless a major problem. Estonian traffic laws requires headlight use at all times while driving and use of a seatbelts by all passengers is mandatory. The Estonian police are very effective and they are not corrupt as opposed to neighboring Russia or Latvia. Estonia has Europe's highest rate of adult HIV/AIDS infections, currently over 1.3% or 1 in 77 adults. Generally, the rate is much higher in Russian-speaking regions like Narva or Sillamäe. Don't make the situation worse by not protecting yourself and others. Information about health care in Estonia is provided by the government agency Eesti Haigekassa. It's easy to mistake Estonians somewhat rude, depressed and unwelcoming, due to the fact that they can be very direct and that small talk generally doesn't come easy. This is just a matter of culture. Don't expect them to deliver too many social niceties or small talk, Estonians only say what's seasonable. It's uncommon for people to chit-chat with strangers wherever they go, including on the bus. Once the ice is broken, you will find them open and candid. Estonians respect physical distance. The most common greeting is a handshake. Hugs are exchanged between family members and close friends. Estonians thrive themselves on a strong work ethic and do what they say. At the same time they expect others to keep their word. Friendships and acquaintances for this reason are highly valued, and just like in Latvia and Lithuania, friendship is something that develops in the long term. Due to a lack of immigration, modern Estonia is a very homogenous society. If you are a non-white traveller do not be surprised (or alarmed) if some people stare at you as they may have never seen someone of your complexion before. Always deliver a simple apology even for being a few minutes late to an appointment. Punctuality is a norm and is much appreciated. Do not raise your voice in a conversation. A decent silent conversation is the Estonian way of doing business. For similar reasons, don't be surprised if an Estonian responds back in a few moments; They prefer to listen more than they like to speak. Avoid asking personal questions and don't be offended if nobody inquires about your family or personal life. Privacy is highly valued in Estonia, and engaging in probing behaviours like asking them about their salaries and so forth is a quick way to make Estonians lose their respect and appreciation for you. Avoid bragging about your accomplishments and desires; modesty is a virtue. Do not haggle. Haggling shows disrespect to a vendor or seller and it is important to note that all prices at stores and markets are fixed and will not change. Use compliments sparingly. Like in several European Nations, hurling too many compliments at someone is considered superficial behaviour and Estonians in general would get offended if you choose to shower them with compliments. Just deliver the simple niceties like "Nice Sweater" and so on, and move on. If you are invited to an Estonian home, always remove your shoes. Bringing a small gift such as pastry, wine, or flowers to the host is appreciated. Contemporary history may be a complicated subject. Estonia`s stance on their history with the USSR is emotional because the country suffered greatly due to the 50 years of Soviet occupation. However, Estonians are usually open to share the experience of the era if easily asked, this is by no means a no-go-zone in conversations. Just be aware of the tragic events of history that led the previously prosperous country into the 50 years of repression. 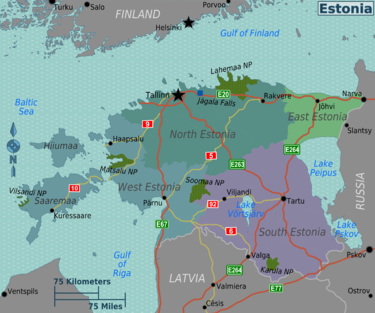 Around a quarter of Estonia's population is Russian-speaking with high concentration in the capital, Tallinn, and in the North-East of Estonia. Make sure that you understand whom you are addressing. A foreigner who initiates a conversation in Russian may get a frosty reception from some Estonians. 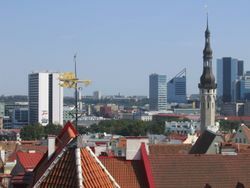 Access to wireless, free internet  is widespread in Tallinn and Tartu. Prepaid (pay-as-you-go) SIM cards and their top up cards can be bought from R-kiosks (ask for a "kõnekaart" - calling card in English). Popular brands are Smart, Simpel, Diil and Zen. Start-up packages are in a range of €1,55-€10. Within Estonia, the postage cost for a letter up to 50 grams is €0,45. To other EU countries, Norway, Switzerland, Russia, Belarus and Ukraine the cost is €1,00 and to the rest of the world €1,10. Be sure to mark all air mail pieces with "Prioritaire/Par Avion" stickers available at the post office, or clearly print it on the mail if needed. Stamps are sold at post offices usually open during normal shopping hours, and also at newsstands. Post offices open on Saturday but for shorter hours than during the week, and are closed on Sundays. This page was last edited on 1 April 2019, at 12:10.